Will Maguire 0423 289 648 or visit www.willblacksmith.com.au for more information. 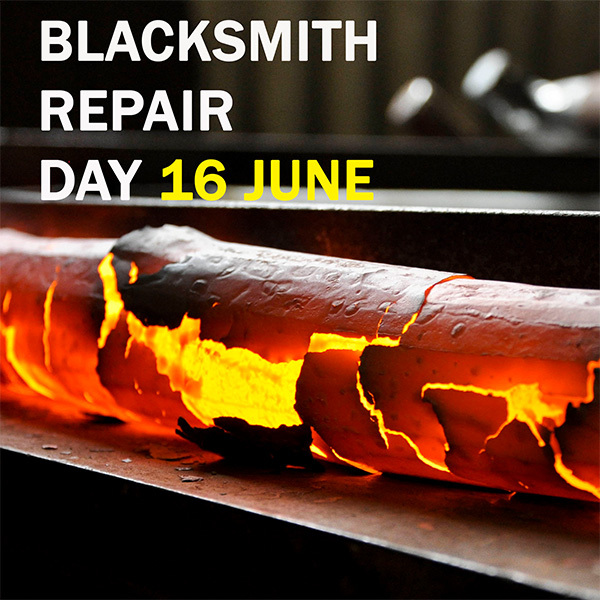 The ancient art of blacksmithing will be on show at the first ever Blacksmith Repair Day to be held on the 16th of June 2018 at Branxton. Hosted by local blacksmith artist and sculptor, Will Maguire, and supported by the University of Newcastle’s Centre for 21st Century Humanities, the community is invited to bring in their old metal items and have them repaired. Mr Maguire will work at the forge on the day alongside his colleagues from the Artist Blacksmiths Association of Australia. Items to be repaired will be limited to steel and other metal items such as hand tools, household items, minor mechanical repairs, gardening or farming equipment and decorative objects. The processes available will be forging, electric welding (MIG/TIG/stick), brazing, riveting, fabrication, bending, straightening, cutting, sharpening/redressing edges. Mr Maguire says the day will be not only about fixing damaged items but also about bringing the community together through a celebration of practical skills that are often overlooked in today’s modern world. “Through this event we can combat some of the excesses of consumer culture by reducing waste and breathing life back into items of worth. I’m also keen to build a sense of community by helping out our neighbours in the process,” Mr Maguire said. People can email Mr Maguire in advance of the day to discuss the suitability of an item in need of repair, however jobs will be taken on as they arrive by the volunteers available on the day. People can drop off their repairs or enjoy a bite to eat from the Slow Food Hunter Valley while they wait for their item to be fixed. “We’d love it if those bringing in items can make a donation. All proceeds raised will go to the Slow Food Hunter Valley who use the funds to educate local kids on the value of food and it’s production,” Mr Maguire said. Mr Maguire first pitched the idea for the repair day at the Centre for 21st Century Humanities Start Up Workshop held in June last year. Director of the Centre for 21st Century Humanities, Professor Hugh Craig said the judges at the workshop were impressed with Mr Maguire’s desire to foster a sense of community and create a culture of reuse and he was awarded seed funding for the project. “We’re proud to support this inaugural event and can see it being very useful to the wider Hunter community. This event puts value on the traditional skills of blacksmithing, an ancient art that is worth preserving, all while fostering a culture that encourages the salvaging of old items,” Professor Craig said. Hand tools such as garden tools, shovels, forks, mattocks, hammers, axes or adzes, pry bars, spud bars etc. these can have their working edge/face forged out and dressed and heat treated, bars can be straightened and re pointed, items can be welded etc. Farming equipment, straighten bent parts etc. see hand tools (above).